Urban legend says that if you’re being robbed at an ATM, entering your PIN in reverse will silently alert the police. Despite the rumor’s popularity, the security feature doesn’t exist. Flipping your PIN won’t work but there are real strategies you can use to protect yourself when using the ATM. Let’s be honest, sometimes you come across ATMs in sketchy locations. Depending on your level of desperation you may still use the machine despite your better judgement. Don’t make yourself an easy target. Avoid using ATMs located within retail stores and restaurants because they tend to be less secure than those located within your bank. 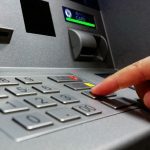 If you’re forced to use an outdoor ATM, stay away from ones located on street corners, near bushes or beside partitions. These areas can create a blind spot making it easier for someone to sneak up on you. These days it’s not uncommon to see people paying more attention to their phone than where they’re going. This is a big no-no especially when you’re heading to the ATM. You always need to be aware of your surroundings. If you spot anyone that looks suspicious or you get a bad vibe, abort the mission and get out of there. Your intuition doesn’t lie. Plus, it’s better to be safe than sorry. Usually when you picture getting robbed at the ATM you envision a masked man holding a gun. However, criminals have gotten savvier and now rely on skimming devices to do the hard work for them. A skimmer fits over the card entry slot and secretly records your information when you dip your card into the machine. Before using any ATM, inspect it thoroughly. Signs that the reader may have been tampered with include glue marks, tape sticking out or the reader hanging off to one side. 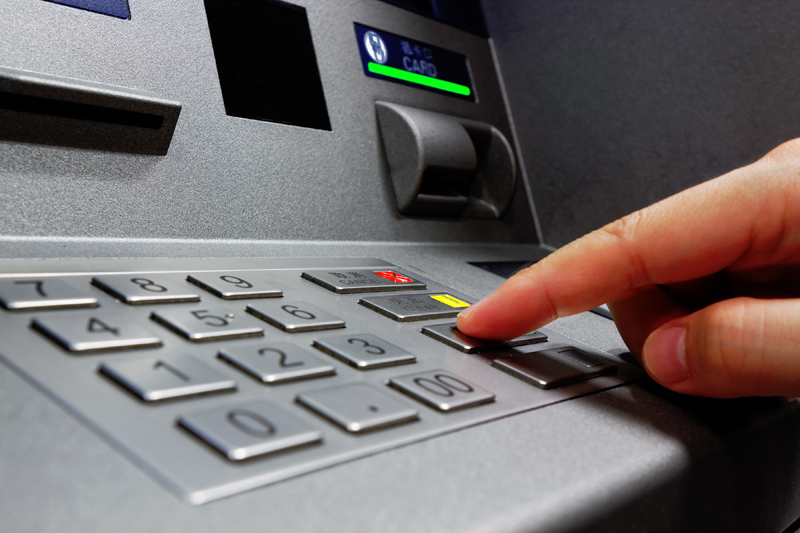 You can protect yourself from ATM skimmers by jiggling the card slot to see if it moves. If it does, there’s probably a skimmer attached. Also keep an eye out for fake keypads and hidden cameras in brochure holders which can capture your PIN number. Using the same ATM repeatedly gives you a good feel for how the machine is supposed to look and operate. Therefore, you’ll be able to tell right away when something’s off. For example, if your card doesn’t enter the machine as smoothly as usual. ATMs are meant for quick transactions such as making a deposit or withdrawal. Everything else can be handled through online or mobile banking. 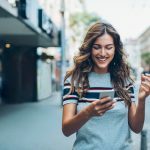 You can view your balance, transfer funds between accounts, pay bills and more without taking a trip to your local branch. The less time you spend at the ATM, the less likely you are to become a target. Losing your debit card is bad but crooks won’t be able to use it at the ATM without your PIN. So, take the proper precautions to keep your PIN safe. The best thing to do is have it memorized and keep it a secret. Avoid writing your PIN on a piece of paper or on the back of your debit card. Lose either one and you can kiss your life savings goodbye. When using the ATM, shield the keypad with your hand so no one standing nearby can steal your information. Many banks offer drive-thru ATMs so you can get your money quickly and go. As with anything else, you want to take the proper precautions. For starters, drive close enough to the machine that you only have to roll down your window to complete your transactions. Keep the rest of your doors and windows locked to minimize the risk of being robbed or car jacked. It’s also a good idea to keep the engine running. If someone tries to approach your vehicle or you get a funny feeling, you want to be able to get out of there quickly. Drive straight to your local police station if you think you’re being followed. No matter how cautious you try to be, sometimes crooks are able to outsmart you anyway. Therefore, you need to keep a close eye on your account. Get in the habit of checking your balance at least once a week. Review each transaction and make sure it’s legit. If you spot a fraudulent charge, report it to your bank right away.